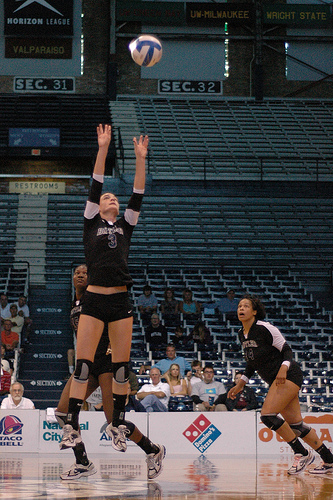 A setter in volleyball uses specific hand and body positioning to deliver a hittable ball to their attackers. When I teach players how to be a setter in volleyball I always like to start with the lower body. Specifically, I'll start with the feet and then I work my way up the body, basically breaking up the setting skill by body part. This way, when you are by yourself and practicing how to set a volleyball and you don’t have a coach, you can check your own form and technique to see if you're performing this skill correctly. When setting a ball alot of people think that the most important thing to focus on is the upper body. I always start coaching the setting skill by focusing on the feet first. Sure, you set the volleyball with your hands but, if you can’t get to the ball and if you don't have your body correctly positioned underneath the ball first, then it won’t matter what you do with your hands because you won’t be able to set the ball. When you’re in the ready position, it means that your feet should be planted shoulder width apart so you are in a balanced position able to move forwards, backwards or to either side quickly. I’m right-handed so I was taught to have my right foot a few inches in front of my left foot. Even if you’re left handed then you want to have your right foot slightly in front of the left and you should have both knees bent slightly. This lower body position helps you maintain your balance, so that you can run to get to any ball. This is what I tell my younger girls, for the correct positioning of their midsection, when you want to be a setter in volleyball, you should imagine having a stick that has been inserted in your back where your spine is. This stick starts from the top of your neck and ends just at your tailbone and it keeps you from being able to twist your body or bend over at the waist. To set the volleyball, once you have positioned yourself underneath it, you can only squat up and down, like you do when you sit down in a chair. The ready position for your arms when you want to be a setter in volleyball is similar to when you run. Your arms start at your sides slightly bent at your elbows in a 90 degree angle. When the ball comes within arm's length above your head, let’s say two to three feet above it, you want to quickly bring both arms up in front of you and as your arms come up, bring them closer together. This way your hands create a cradle where the ball will settle into when you contact it above your forehead. This cradle that you’ve formed is what you use to accompany or lift the ball back into the air towards your intended target. One key to remember is that as your arms move back up to the sky with the ball cradled in your hands you want to keep your hands in the shape of the ball for as long as you can. This way you have control of the ball. 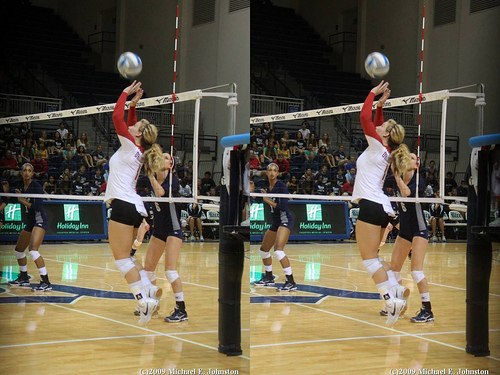 Just to double check, the correct hand position when you're a setter in volleyball is for both of your palms to be turned up to the sky, which should form that cradle which fits perfectly around the ball. Both of your index fingers and thumbs of each hand are not touching each other but are very close as they form the shape of a loose triangle which you should place like a window right at the top of your forehead where your hairline is. 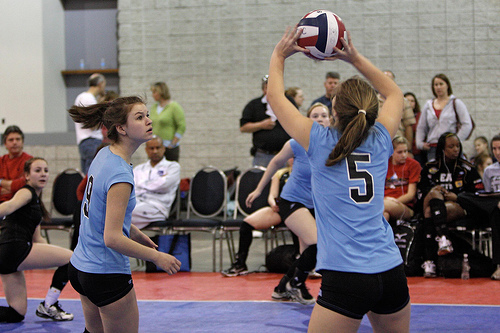 Now in your next volleyball practice, focus on using the correct technique, body positioning and timing while you do your reps so that you become a great volleyball setter. 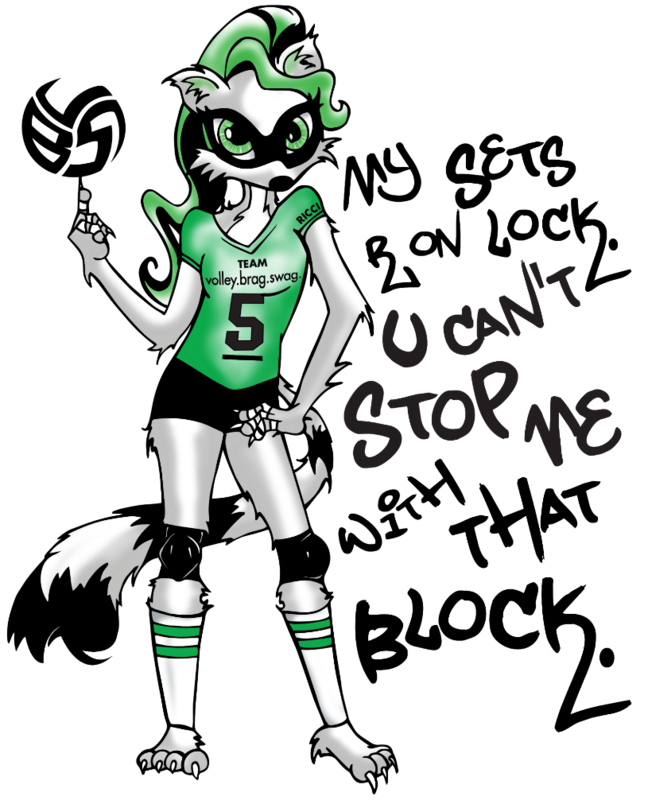 Meet Ricci the Raccoon setter for the Volleybragswag All Beast team.